Pillayarpatti Karpaka Vinayakar Temple in Tamilnadu, India is one of the oldest rock cut cave temples in the world. 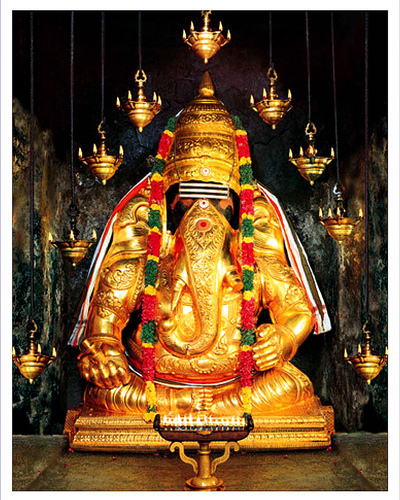 The temple is dedicated to Lord Ganesha – popularly known as Pillayar in Tamil language. The ancient temple is located at Pillayarpatti, which is between Pudukkottai and Karaikkudi, in Sivaganga district of Tamil Nadu. 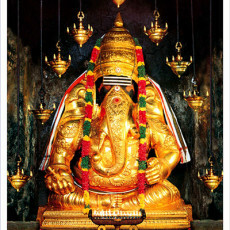 Arulmigu Karpaka Vinayakar Kovil is built during Mahendra Pallava period 1600 years ago. The temple enshrines a 6 feet tall image of Lord Ganesh with two arms and a trunk curled towards his right in the Valampuri mode. Ganesha is seen seated without Angusapasam, with his legs folded and stomach not touching the Asanam in the form of “Artha Padma” Asanam. Lord Shiva is worshiped here as Arjunapureeswarar. The temple houses rock cut images of Lord Shiva and Lingodbhavar. Ganesh Chaturthi Festival or Vinayaka Chaturthi is the most important festival celebrated for 10 days in a grand manner during the months of August – September. Tirukarthikai Deepam is another important festival. Monthly Chaturthi days are significant in the temple. Pillayarpatti is around 71 km from Madurai and 12 km from Karaikudi on Thirupathoor – Karaikudi state highway. By Bus: Thiruppatthur Bus Stand is just 1 km from the temple. Nearest Airport: Madurai International Airport (70 km) and Tiruchirappalli International Airport (100 km). Railway Station: Pudukkottai railway station (Station code: PDKT) and Karaikkudi Junction railway station (Station code: KKDI). Rameswaram Express and Kamban Express passes through these two railheads. Tirupattur Thiruthalinathar Temple dedicated to Lord Shiva is just one kilometre away.